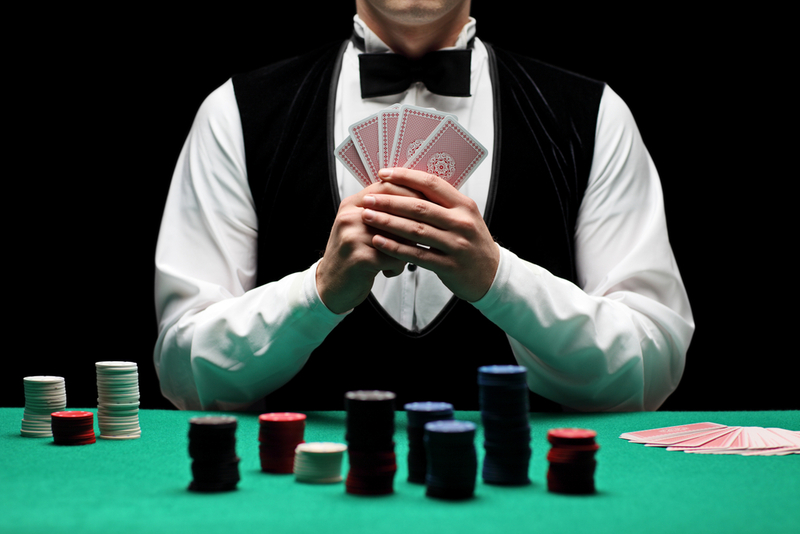 We know that humans have been infatuated with gambling for as long as we have records. Some of the earliest games of chance were forms of a dice game that used the squarish knucklebone of hoofed animals. These bones have been found at archaeological digs all over the world, showing that we used this precursor to the modern dice as far back as 40,000 years ago. Gambling was a constant fixture in the lives of both the ancient Greeks and Romans. Famously, Pontius Pilate’s soldiers cast lots for the robe of Christ as he suffered on the cross. In Greek mythology, three brothers rolled dice to decide how to divide the universe. Zeus won the heavens, Poseidon the seas, while Hades, the loser, was sent to hell as master of the underworld. Our obsession with besting chance has not changed since ancient times. The total known sum of global gambling losses was estimated at US$400 billion in 2017, equivalent to roughly one third of Australia’s annual GDP. Undoubtedly, the actual amount is far higher than this – Americans are estimated to wager US$150 billion a year on illegal sports betting alone. In Australia, gambling is almost the national pastime. Australians are the biggest gamblers in the world, losing on average $990 per resident adult in 2016, 40% more than runner-up Singapore. Gambling then, remains very much a part of the human experience. But what separates a random game of chance from the supposedly more highbrow venture of investing? It is a question that leaves many fund managers shifting uneasily in their seats. Indeed, the inexorable rise of the passive investment industry is based on the uncomfortable truth that few professional investors outperform the market when measured over long periods of time. In the age of Exchange Traded Funds (ETFs) and efficient financial markets, generating investment returns is in fact relatively easy. Over long enough periods of time, most asset classes generate positive investment returns. Given this, the skill of investing can hardly be thought of as the act of generating positive returns. This is especially the case during periods like the present, where a 9-year equity bull market has provided a powerful backdrop for most investment portfolios. Instead, what should separate the work of investing from a random toss of a coin is the skillful assessment, management and bearing of financial risk. The real art of investing should be that, over time, you were paid better returns than the odds you took to play. Yet despite this, the concept of investment risk remains one of the least talked about aspects of the investing landscape. Ask an investor what their portfolio returned last year, and you will receive a precise and immediate response. Ask that same investor how much risk they bore to generate those returns and too often the response is a blank stare. Given the fundamental principle of investing is ‘risk versus reward’, it is unnerving how little time is spent contemplating the former part of that equation. One of the challenges that a wider appreciation of ‘risk’ confronts, is that of trying to account for the vast range of possible outcomes within financial markets. This can be an overwhelming proposition. Faced with this task, most financial risk management, when it is done at all, becomes a mathematical exercise in quantifying risk based on historical events. This exercise often polarises people. For some, the mathematics of modern risk management provide a worthwhile framework within which to access the future. It also provides the only quantifying tools we have available to compare the historical ‘riskiness’ of different investment returns. However, assessing risk in an isolated way like this can be a deeply flawed exercise. Calculating the probability of known historical events only tells us one thing: the probability of events that happened in the past. Herein lies a standard rebuttal of much of the financial risk management used today. We can only precisely quantify risks that appeared in the past. We cannot quantify the risks that may appear in the future and just as importantly, we cannot quantify the risks that did not appear in the past. Landing safely after skydiving without a reserve parachute does not prove that you will never need one. Such arguments do not mean that evaluating risk is a futile exercise. Rather, just like all the other parts of the investment process, it means that understanding and managing investment risk is by necessity both a quantitative exercise and a subjective exercise of skill. The best money managers are not statisticians, but rather investors who use the framework that quantitative risk management provides to find opportunities that deliver better outcomes than random chance alone. Unhelpfully, the mathematics involved in quantifying risk are less straightforward than the mathematics used when calculating returns. If you bought a stock at $1 per share and it goes to $1.50 per share, calculating your investment return is a straightforward exercise. Few of us however, can calculate a standard deviation of returns figure so easily in our head. The more daunting mathematics and the evident shortcomings of quantitative analysis in isolation, too often mean that investors overlook the importance of thinking about risk altogether. This is a great mistake. For one, all the shortcomings that apply to quantifying risk apply in equal measure to quantifying returns. Despite all the disclaimers stating: ‘past performance is no guide to future returns’, the first metric we all look at when assessing an investment proposition is what historical returns have been. We do this because whether the regulator likes it or not, it helps us with the necessary subjective judgements we make when considering a proposition. A skilled investor is one who can form the same sorts of subjective assessments about risk as most of us do regularly when thinking about returns. The workhorse in most risk measurement exercises is the concept of volatility. In simple terms, the more volatile an investment is – the greater it moves up and down over time – the riskier it is as a proposition. In statistical terms, volatility is a measure of the dispersion of returns around a mean (a standard deviation). Fortunately, it is not necessary to understand statistical mathematics to be able to usefully apply this concept to your investing. Over the long-term, the volatility of global share markets has been 15%¹. In contrast, the volatility of global bond markets (a much less risky investment class) has been 6%. Long-run average annual returns for global shares have been 5.3%, while for global bonds they have been 3.9%. Without needing to understand how volatility is calculated, with this information we are now able to put rigor into the idea that investing is a trade-off between risk and reward. The more volatile (risky) an investment is, the greater the returns need to be to compensate you for taking extra risk. Conversely, an investment that shows high historical returns, but also high historical volatility, may not have achieved a result any better than random chance. Taking these concepts to their natural conclusion is the Sharpe Ratio, which is the most widely used metric of risk vs. reward in finance. The usefulness of the Share Ratio is that it gives us a simple way of fairly comparing very different investment propositions. It effectively shows the ratio of returns dividend by their risk (volatility), with a higher ratio indicating better risk-adjusted returns than a lower ratio². Using the above example, the long-term Sharpe Ratios for global share and bond returns³ are 0.23 and 0.38 respectively, showing that, historically, global bonds have delivered better risk-adjusted returns than share markets have. For Australian investors, a worthwhile data point to consider when thinking about your own investment options is that the long-term Sharpe Ratio of the ASX200 is 0.34. The bull market of the past few years has generated returns far greater than what long-run average share market returns have been. Hanging over this is one of the most powerful forces in finance, the notion of the return to the mean. It is a particularly brave investor who assumes that the double-digit annual returns seen recently are sustainable in the long run. Given this, it is becoming increasingly important for investors to distinguish between the quality of returns and not just focus on the absolute return numbers themselves. Many investors today would benefit greatly from a deeper understanding of the concepts of investment risk. It is easy to be seduced by a dazzling set of returns, but without an appreciation of the risks behind these, they mean little on their own. The real skill in investing is often an unacknowledged one, in a rising market an ability to beat random chance is easily overlooked. Yet ultimately, over the long-run, the test of an investor is whether they managed to generate returns greater than the risks they took, not whether they made money in a bull market. ¹ All figures referred to are in US$ terms, except ASX200 which is in A$ terms. All figures are sourced from Bloomberg LP. ² The complete Sharpe Ratio formula also makes an adjustment for risk-free interest rates, though this does not change the essence that it is just the ratio of returns divided by their risk. A fuller summary of how the Sharpe Ratio works can be found at here. ³ Including the risk-free interest rate adjustment.